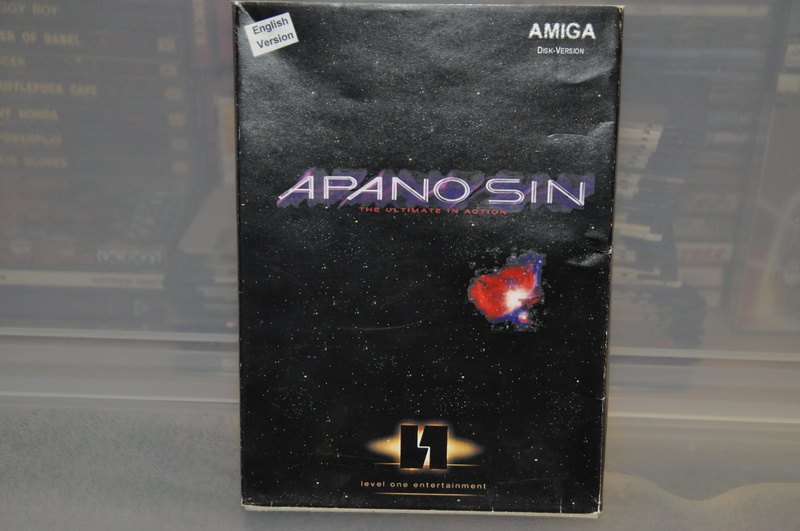 Apano Sin is one of those games that most can’t even remember, I am one of many who only looked at this for a few minutes and thought, not for me! 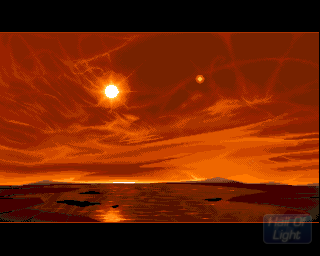 18 years later and it is safe to say that I was wrong, the game plays brilliantly and it is quite the technical achievement really and a game that could have been a proper classic if reworked a bit, more about that soon. 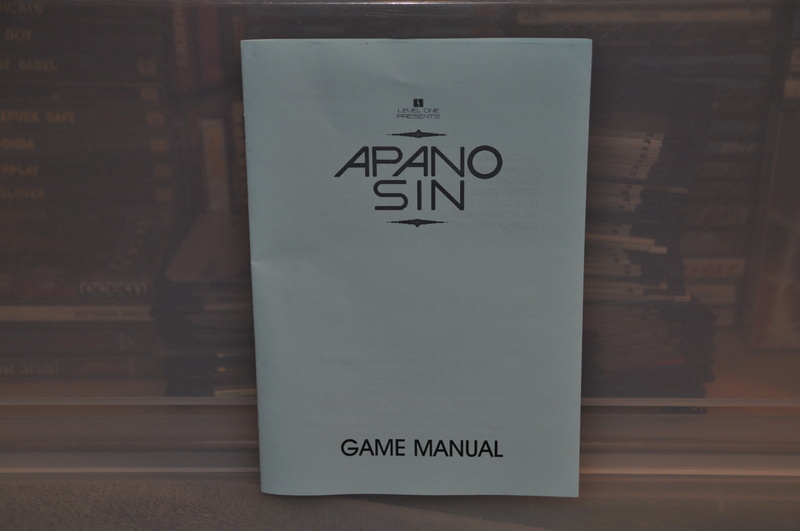 Apano Sin was originally supposed to come out in 1993, everything was finished and the game masters were about to be sent to the “duplicator”. 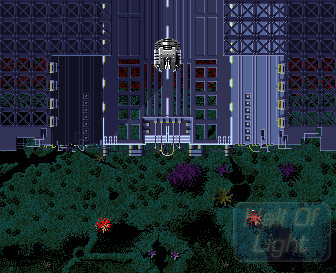 It never happened as the developer “Level One” pulled their contract in the last minute as they didn’t agree with their publisher (NEO Software) regarding ownership and developer rights. It took Apano Sin 7 years to be relevant again, the game had been long forgotten by most and when information came out about what actually had happened and why the game never was released, well, needless to say, that most never looked at NEO Software the same way ever again. 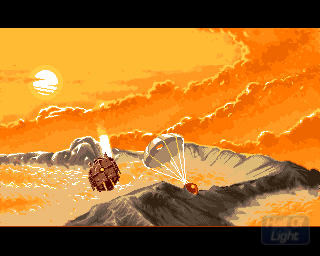 NEO Software certainly had an impressive amount of good games released for the Amiga, most probably only know the obvious ones like the utterly brilliant Fighting Spirit by Light shock software and The Clue! but there were others too like Black Viper, Cedric and Whales Voyage to mention some of them. It also has to be mentioned that NEO Software eventually changed their name into ROCKSTAR Vienna… and made games like Manhunt 2 among others before being shut down in 2006. Apano Sin would have looked really good on NEO’s résumé for sure and this is most likely why they tried to get the credits for it too. 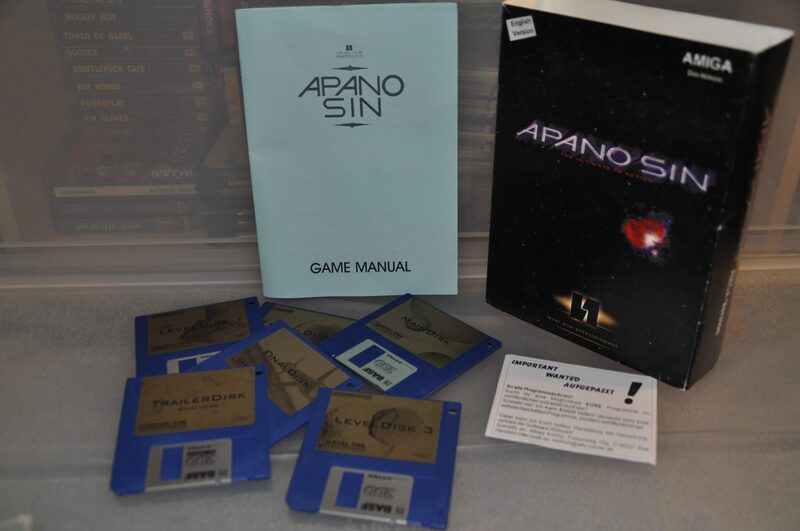 The first thing that you will notice with Apano Sin is that it comes on 6 floppy disks. 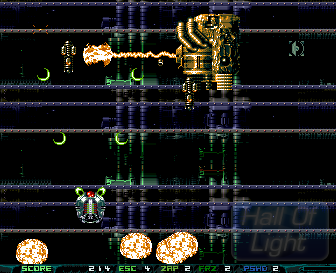 It is probably the largest ever Vertical Shoot Em Up to ever hit the OCS/ECS Amiga. 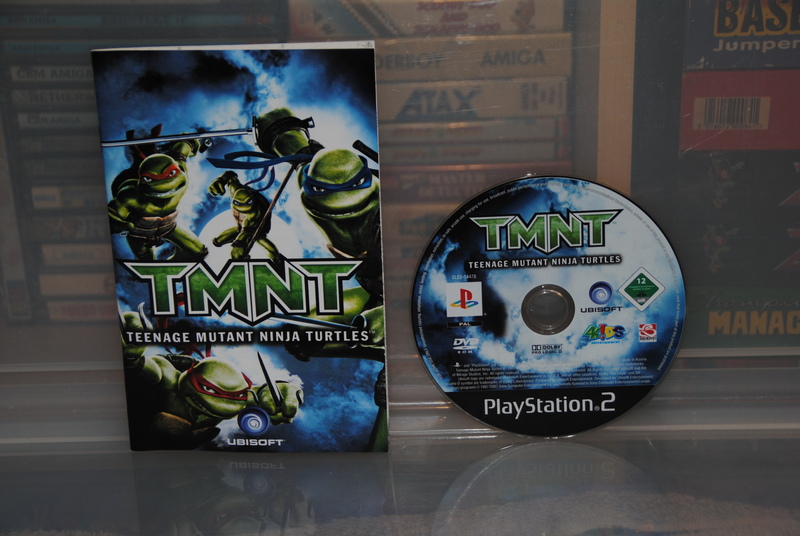 The first disk is only for the opening intro and while that sounds like a good idea it has to be said that the intro is pretty boring to put it nicely, the art style and animation is good though and worthwhile your time. 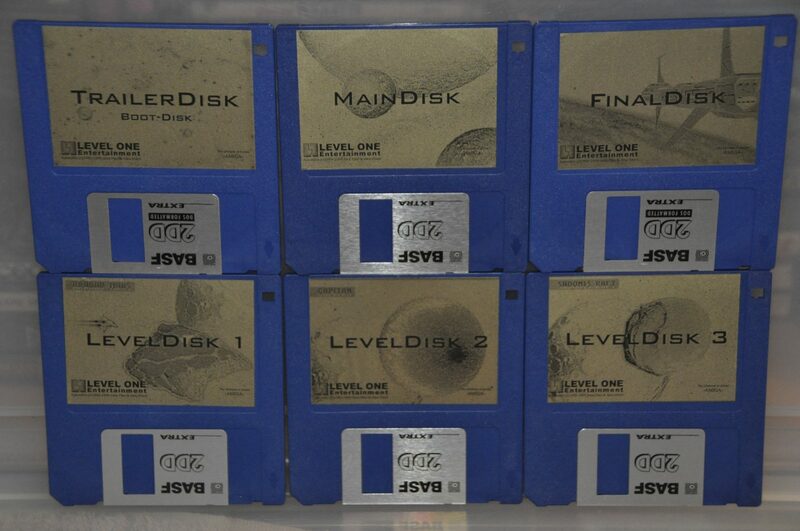 All 6 disks got proper labels and a distinctive design that match the location in the game, notice the final disk where you see a picture of the end movie (more about that soon). 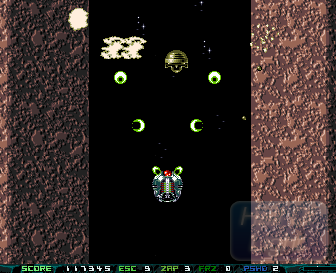 Apano Sin certainly delivers on the technical side of things with a rather good fullscreen multi-layered Parallax Scrolling system (with horizontal overscan++), both in-game music and sound fx and loads of enemies on screen are another bonus and to make it even more advanced they even threw in loads of explosions and bullets just to make this one heck of a technical ride for the old Amiga 500 machine. 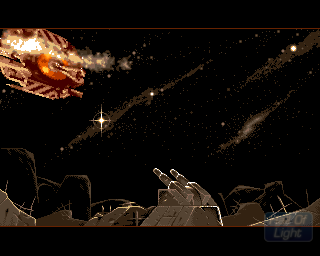 For some very odd reason the main problem with Apano Sin ain’t the gameplay or the technical stuff at all, the reason why many don’t remember this as one of the greatest is down to the very annoying sound fx and music combo, 99% of the time while playing the game will consist of you listening to a very loud and annoying EXPLOSION sound, it is so awful that i actually wanted to switch off the game within 10 seconds. Why on earth they went for this awful sound is beyond me as it destroys not only the music and the other effects used in the game, it actually destroys the whole god damned game. 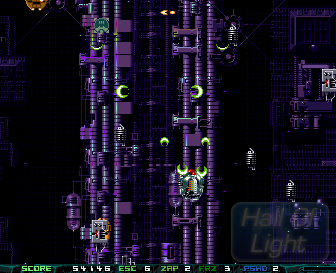 The game got a lot of cool weapons with a really good upgrade system that aches a little towards Hybris and the likes where you upgrade your ship by picking up modules that expand your ship both visually and mechanically. 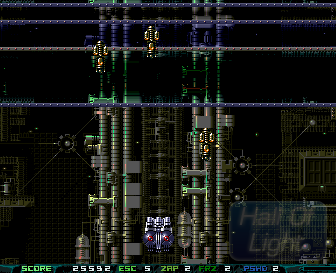 Another neat design is that you can aim behind you if needed (by flipping the ship), it does the job but with some tweaks, this could have been a brilliant idea. 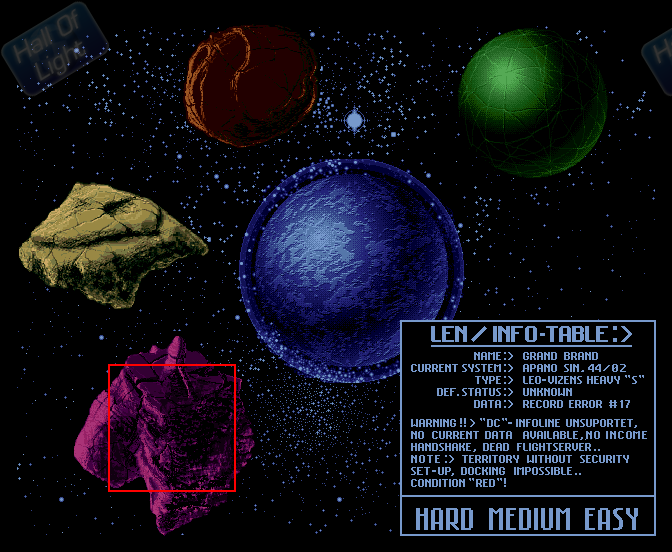 As seen in the picture above the game supports 3 button joystick/pads if available, pretty uncommon for an Amiga game. 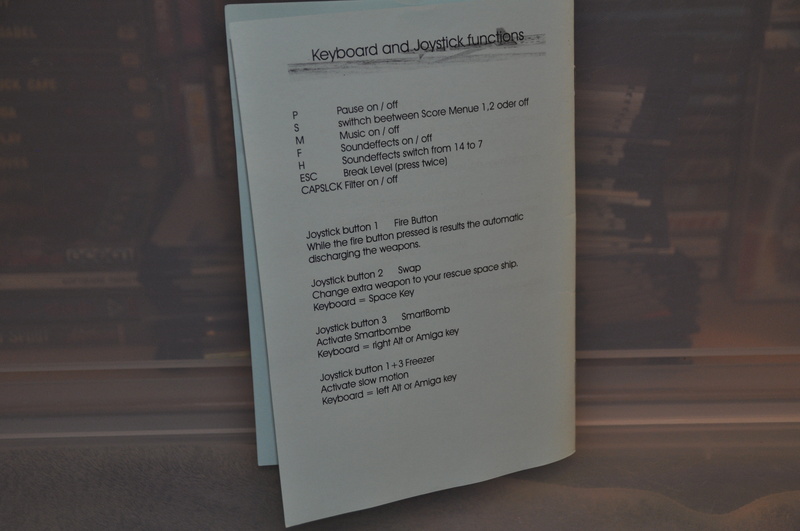 I decided to add this picture for various reasons but mainly to show the number of keys in use as most people most likely downloaded the game without the manual. 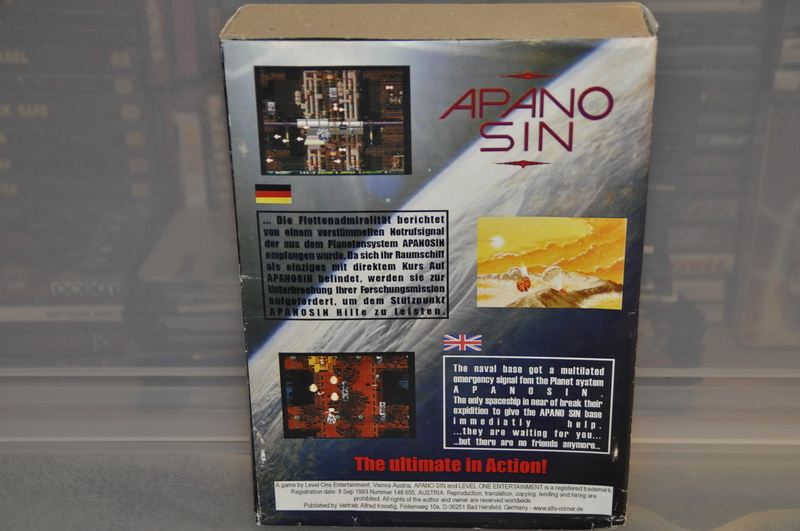 Yes, Apano Sin was a commercial title but the full version is now available at the Amiga Future website, there’s also a WHD install and there’s even a CD32 homemade compilation featuring it too. 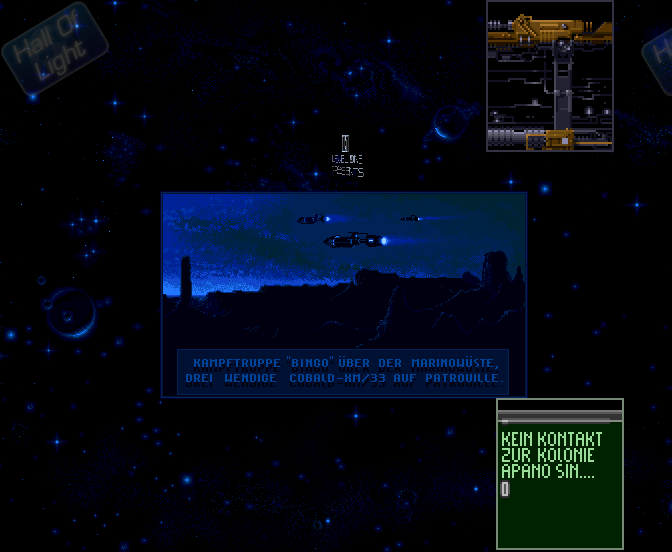 These pictures show one of the things most here haven’t seen before i guess, the ending of the game. A splendid animation with some really nice graphics let the game shine its last time until it will be forgotten again sometime in the future. The box design for the game ain’t all that much, it feels rather generic and the quality of the paper and box etc feels ok but nothing special, but the thing here that makes it a bit special is that this is one of the last big box games to grace the Amiga at the time and therefore a really cool addition to your collection. V.A.K could have taken the easy route of just putting out some half-arsed box or whatever but instead, they went and did the thing that made me really appreciate the release, a full sized box in early 2000 = INSTA BUY! 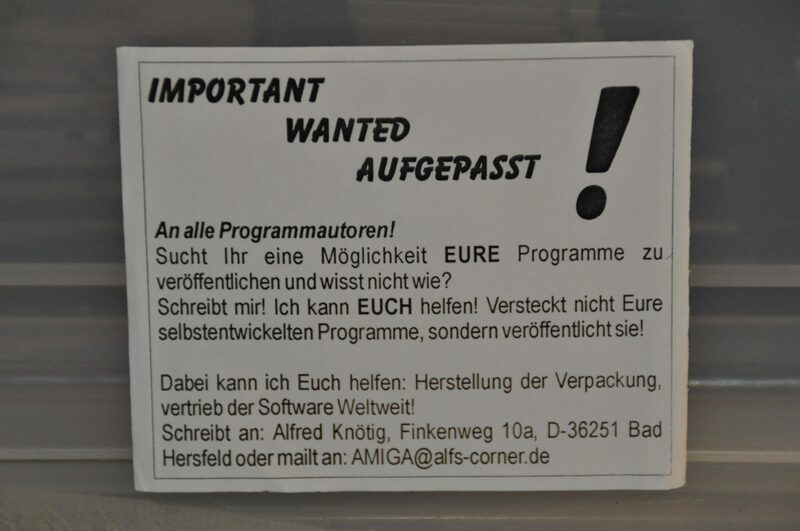 This little piece of paper was also in the box, it’s only in German for some reason (although my box is the English one) but in short, the publisher is looking for coders/programmers, how this venture turned out, in the end, is unknown but seeing how V.A.K didn’t publish anything after Apano Sin… well, we can only guess that it didn’t go too well. 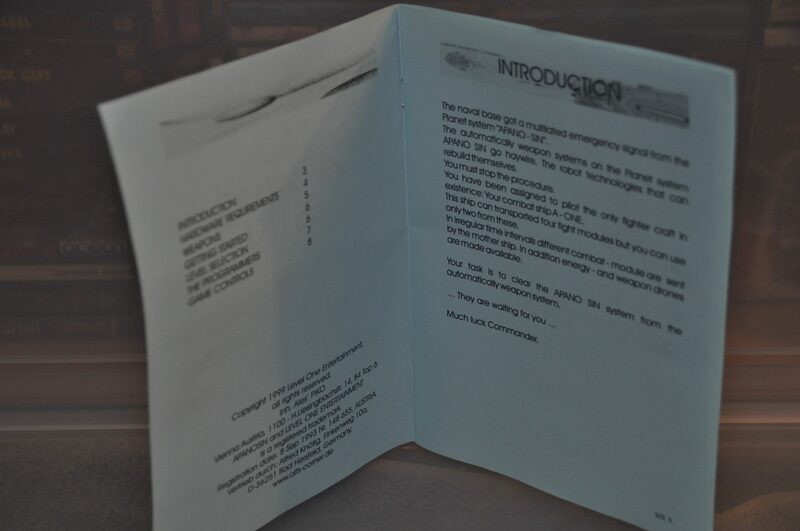 The manual for the game is rather limited and not much of a looker, 6 pages and no pictures or design etc, one thing though is that it got the controls listed and those helped me at least (see earlier in the article for why). 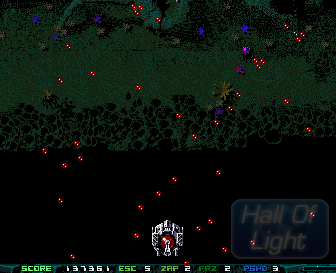 Screenshots from Hall Of Light and Box shots and set up from my own collection. 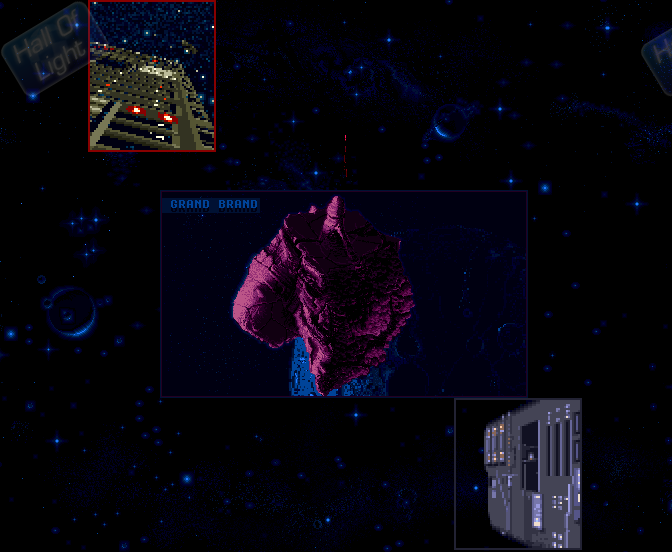 A New Amiga Experience – FlowerPot Review Centron 3D Amiga – Is It Real? I bought this in 2003 but not tried it yet ?